1. What is Art Masking Fluid? It's a fluid (also known as liquid frisket ) that preserves white areas, white areas of the paper where you want to stay white. It's made of some sort of latex. Once you place it on your watercolor paper (on the area you want to stay white) wait until it completely dries before starting to paint. At the end, once your paper is dry, you can peel it off easily with your fingers or using an eraser. ​No, you absolutely don't need art masking fluid. It makes painting easier if you want to avoid certain areas, leaving them white, but 99% of the time I don't use it. Besides it's a better practice for you to paint without it, to learn to paint around objects. You can buy it at any art store. 4. Do I use watercolors in pans or out of tubes? I mostly use watercolors out of tubes. I think it helps me in painting with layers and creating full backgrounds. 5. How long does it take me to finish a painting? Anytime between 40min - 3hrs. It all depends on what I am painting. 6. Do I sell my art? Yes I do sell some of my paintings. If you click on "Buy Paintings" or "Buy Prints" it will take you to an Etsy shop. 7. What if I want a print of a painting that I saw on your YouTube Channel but it's not in your Etsy shop? You can email me directly at: mariamorjane@gmail.com and I will be happy to add that painting to my gallery. 8. What are the basic colors, brushes papers I recommend for a beginner? 9. What's the difference between cold pressed, hot pressed and rough watercolor paper? Cold pressed is on the rougher side and hot pressed is the smoothest. For example with hot pressed the paint won't sink in as much and will dry faster, vs cold pressed is the most traditional watercolor paper for artists, it has a texture and the paint will sit for a while until it settles and you can do dry brushing. It also dries longer because of all that. Then there's Rough watercolor paper, it has a tooth to it. It has more of a texture than Cold Pressed. It feels drier/rougher. They are all fun, I just have been painting mostly on hot pressed because of my style. Hot pressed is good when you can paint faster and when you use a lot of paint. To determine which paper is best for you I think it's a good idea to try out all three kinds: hot pressed, cold pressed and rough. 10. Why doesn't my paper buckle? When working with a single sheet of watercolor paper, I place it directly on a glass. It's a regular glass - kitchen cutting board. With all the water and paint I use, it helps to keep my paper in place. Recently I have been painting a lot with Arches Blocks. The paper is glued by all four corners and stays in a block as long as you want. So if you are experiencing a lot of buckling, warping I recommend trying watercolor blocks. 11. How do I make my paintings look so vibrant? I believe that the intensity of my paintings comes from layering and composing the right colors together, creating contrasts like putting two colors together that will compliment each other. 12. Do I tape my watercolor paper down? When placing my watercolor paper on a glass I just let the water/paint create the suction that keeps my paper in place. Sometimes I will tape my paper down to have a white frame around my painting. 13. How to protect my watercolor paintings from fading over time? 14. How long have I been painting? 15. How do I start a painting? If you are painting from a photograph try to think of all the colors you see, place them on your palette, sprinkle with water, prepare the brushes you will need. For example if you are painting trees, you may need an angular brush and a small round for branches? If it's sky, perhaps a fan brush? decide if it's wet on wet or wet on dry. If it's a night scene I'd recommend wet on dry and just add water to your watercolor, for example indigo. If it's night you will need more paint and it's much easier to use watercolor out of tubes. If it's a day sky then you may want to do wet on wet, this way you create light layers by adding a little bit of watercolor diluted with a lot of water, and use paper towel to create clouds. 16. Can I copy your paintings on YouTube? My tutorials are for you to learn and paint along with me. So yes as long as you are not trying to make money off of the copies. © If posted on any social media, please give me a credit stating it's a copy of "Maria Raczynska's painting..."
What I don't allow and it's a copyright infringement is creating your own YouTube Channel with my videos without my permission. Creating your own YouTube Channel copying my art tutorials. Submitting to art contests without my permission. 17. Where does my inspiration come from? Everything that's around me, memories from travels, childhood, things I see everyday. 18. How long do I normally wait to add a second layer? It depends but for the most part I don't wait for the layer to be completely dry before adding another one. When you see me moving to another section of the painting, that's because I'm waiting for the previous section (that seems too damp wet), to dry “just a little bit”. Once I feel the paper is not as wet anymore (not dump wet, just a little wet) I go back. When it's still slightly wet, it actually helps to add another layer, it helps watercolors to blend in nicely. 19. Can I paint with watercolors on any paper? I recommend painting watercolors on watercolor paper only. Because if you just use any paper the surface will warp, the paint doesn't go well, the colors won't come out right. It will be difficult for you to frame a warped paper. 20. Can I replace Designers Gouache Permanent White with acrylic white paint? I haven't tried mixing watercolors with acrylics. From my experience acrylics dry super fast while with watercolor you can keep adding water and you can play with the painting as much as you want to. The white gouache I use is basically an opaque watercolor. It's called Designer's Gouache and the color is: Permanent white﻿. But from what I hear, yes you can :) After all it will become mixed media. 21. Where do I live? I'm located in Los Angeles, CA. 21. Do I have an art degree or any training? I'm a self taught artist. 22. Do I teach art? I haven't started giving any classes yet but soon! 23. Can I have your pencil sketches? Patreon is an Internet-based platform that allows content creators to build their own subscription content service. It's a place where an artist gets supported by his community. My subscription starts at $4/ month where you have access to 2 real time videos per month but with $6/ month you also get my pencil sketches for download - ready to print on your watercolor paper. You get access to my reference photos and you can use pictures of my paintings for your reference (also available for sub $4/per month). I also share my daily work with you over there and you get 20% off my Etsy shop. 25. Do I have instagram? 26. What is my favorite color? 27. How can I show you my work/ contact you? The fastest way to contact me is by writing in comments under my videos. 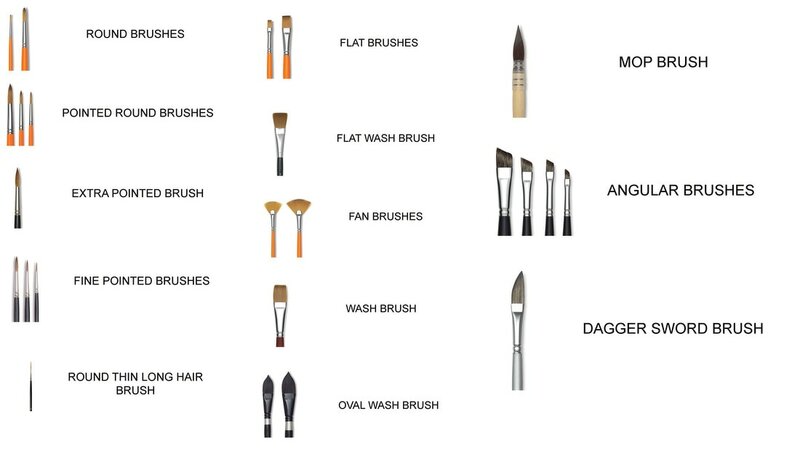 There are different types of brushes you can use in your watercolor paintings. They come in different types of hair and fiber (synthetic brushes are usually made of nylon or polyester). A good brush should be able to keep water and paint in its body and distribute it smoothly on your watercolor paper. It should also not loose it's shape after few strokes. A good brush should be able to go back to it's shape and should hold a point. The best brushes are made with sable hair. There are also flat brushes made of bristle. These are good if you work with a lot of paint and water creating large washes. Brushes come in different sizes, depending on what you want to achieve ... big stroke and washes or more of a detailed work. ROUND BRUSHES - the most common in Watercolors (round or pointed tip): great for details, washes, thin to thick lines depending on a size. ROUND WITH LONG HAIR BRUSH - The extra long, delicate bristles of the brush make it perfect for fine, straight lines and lettering. I often use it to paint whiskers, hair, flower stamens. WASH/MOP BRUSHES (bigger brushes with different shapes) great for wetting the paper and when working with a lot of paint/water creating backgrounds like sky and water. As a watercolor artist I think watercolor paper plays the key role in your watercolor painting. When you first start painting it may be a bit confusing on what paper do you want to buy. What you need to know is that there's three types of watercolor paper: cold pressed - the most common one, with a texture, rough - the bumpiest, with more of a texture and hot pressed - the smoothest one. Cold pressed/hot pressed and rough are available in different weights measured in pounds per ream or grams per square meter. For example cold pressed can be available in 90lb, 136lb, 140lb, 200lb, 300lb or even 400lb. The more weight you see, the thicker the paper will be and it will be able to absorb more water. 300lb and up will also not buckle. It's a bit more expensive than for example 140lb but it's definitely worth it if you struggle with your paper buckling/ warping. The most standard paper comes in 90lb, 140lb and 300lb. I think hot pressed is great for more realistic painting and illustrations because of its smoothness. It's also easier to do a pencil sketch. While hot pressed is the smoothest, cold pressed has a little bit of a bumpy texture, it's basically between hot pressed and rough watercolor paper. Rough has a "tooth" to it, it's quite bumpy and it's great for dry brushing. It gives a great texture to landscapes. Keep in mind that different companies make their papers different and some that offer hot pressed may not be as smooth as the other company's hot pressed etc. Watercolor paper also comes in colors like: brightest white and natural white. I personally prefer brightest white because I am more about the vibrancy of my paintings. Watercolor paper comes in pads, blocks, sheets, rolls and boards. When you buy blocks you will have papers glued on each corner together, let's say 12 watercolor papers in a block glued to each other just by the corners. It's easy to separate each sheet by pulling it off the block. It actually stops the paper from buckling, another option if you don't want to buy watercolor paper that's 300-400lb. Pads are most common, that's when you have lets say 12 sheets of watercolor paper stuck together but only glued on one side. You also have artists quality paper - acid free, it lasts longer vs cheaper quality student grade.